Tuesday I got my brand New and Shiny CPAP Machine, an AirCurve 10 VAuto. It’s like, magical. It uses a data network (NOT OURS!) to communicate with Susan at the supply company. And it autothingies all the things. I loves it. Well, the idea of it. The application, well, that is taking a bit to get used to. The first night was fine. Except I couldn’t get the hang of keeping my mask on, so air was leaking all around it. 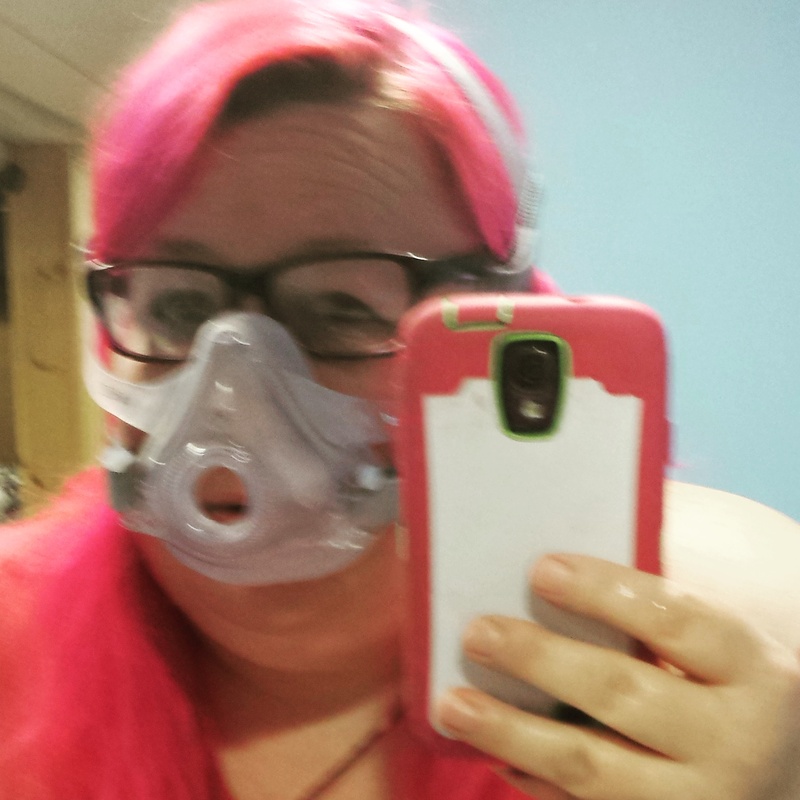 Also, in spite of the built-in humidifier, my mouth was super dry, which made it difficult to keep the mask on my face. I got a frowny face for my mask seal when I checked my progress on the unit. 🙁 Sad Lanna Was Sad. How did I feel? Well, yesterday morning was a bit easier. I did not feel like crap when I first woke up, at least not to the same extent as previously. So, #winning! 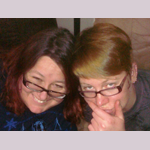 One thing we did was take Susan’s advice and purchase some Biotene spray to combat dry mouth. Last night went a little better with the mask, and the biotene: it is much easier to keep the mask in place when your mouth is not painfully dry. As you can see from the picture, I got a smiley face for my mask! 🙂 But my face hurt and I had actual bags under my eyes. So that sucked. Susan from the medical supply company called earlier today to see how I was faring. Since my stats uploaded automagically, she was able to give me a report of how things looked on her end; my stats improved so much!!!!!! 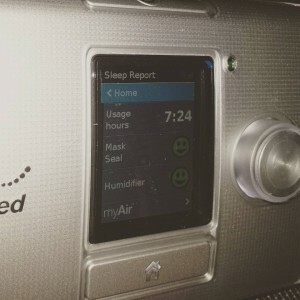 When determining Sleep Apnea they look for two things, AHI (Apnea-Hyponea Index) and oxygen levels. The AHI is the average number of apnea-type incidences per hour. 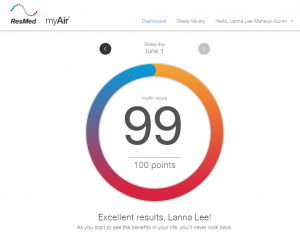 Mine was tested at 39.7, which counts as severe sleep apnea (should be 0-5 per hour). Going hand in hand with that are oxygen levels, mine got as low as 49%, should be over 95%. With the machine, my AHIs decreased to less than 1, which would be considered in the normal level. This is even with a leaky mask. They aren’t testing my oxygen levels with this, but I suspect they are within an acceptable range. I am still a bit sleepy during the day. But Susan said that since I’ve likely been sleep deprived for a few years, it will take a little while before I stop getting sleepy. 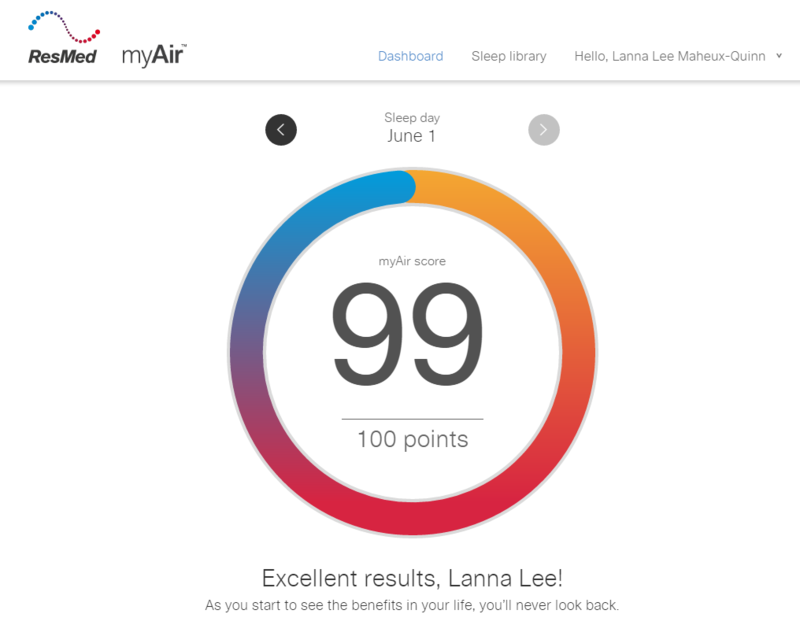 I joined the myAir online thing so I can track my progress online, and because I am a super data geek. Here is an example of my dashboard for it. 99 points! Woo! 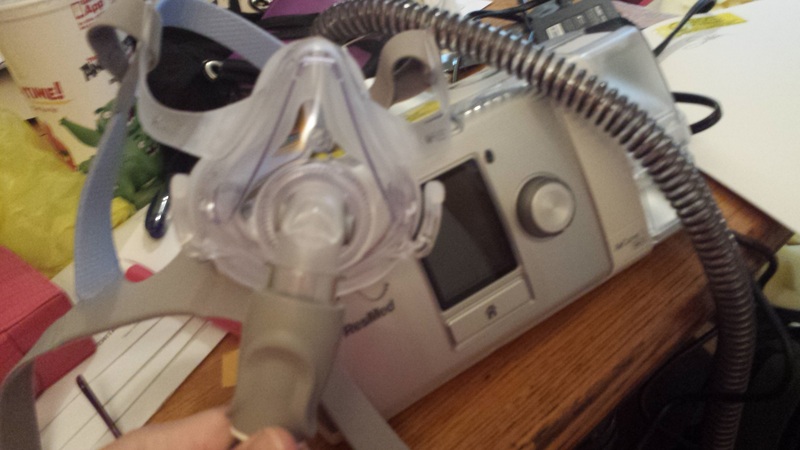 When Susan came by with the machine she said I should try to use it at least 4.5 hours a night (some insurances won’t cover the CPAP if you don’t use it over 4 hours per night). I don’t get that, if I have a CPAP machine, I am going to use that sucker. Now that I am no longer swimming in the sea of sleep apnea denial, I am totally on board with getting a full-night’s sleep. One thing that might need to change is my face mask. I have 30 days to trade it in, and I suspect it is too small for my face. My cheeks are still sore from wearing it! We are going to wait and see how things go and trade in for a new one if this one continues not to work out. 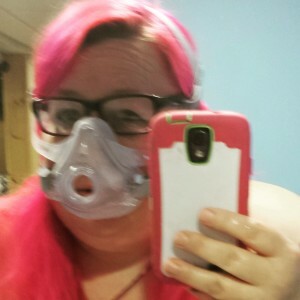 TLDR: Things are going well with the new CPAP machine. Even with mask seal issues, my AHI levels are normal after using it two nights. 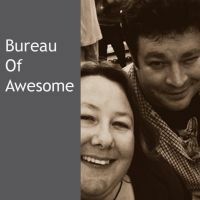 Friends have said it took them a couple of weeks to assimilate, so I am on track as far as that goes. And now it’s almost time for bed!